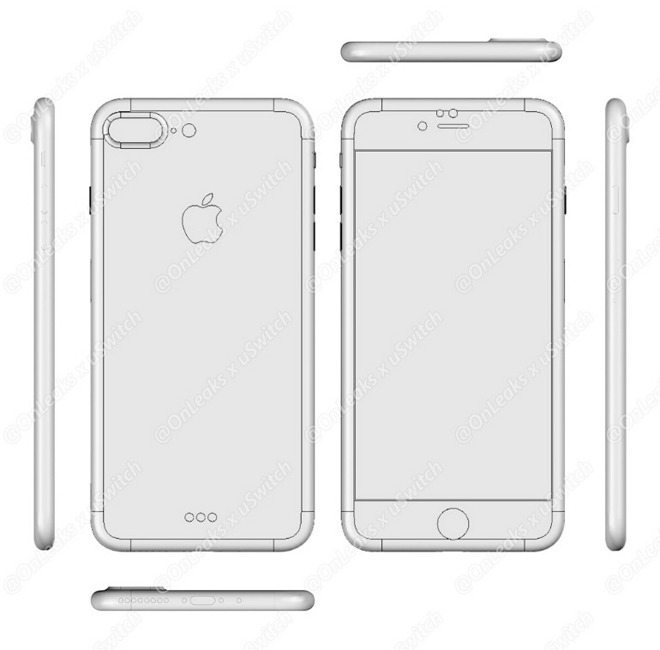 Alleged "iPhone 7 Plus" schematic, via USwitch. Alleged factory designs for both models were leaked on Wednesday by USwitch. They show an "iPhone 7" design largely similar to the current iPhone 6s, while the bigger "iPhone 7 Plus" appears to receive the most significant changes. In particular, the design shows a larger, oval-shaped camera protrusion on the back of the device, suggesting it could house two lenses, as has been rumored. Notably, back in January, analyst Ming-Chi Kuo of KGI Securities suggested Apple's dual-camera iSight array could be exclusive to the "iPhone 7 Plus." It's believed that the design is based on imaging technology that Apple obtained through its acquisition of LinX in 2015. 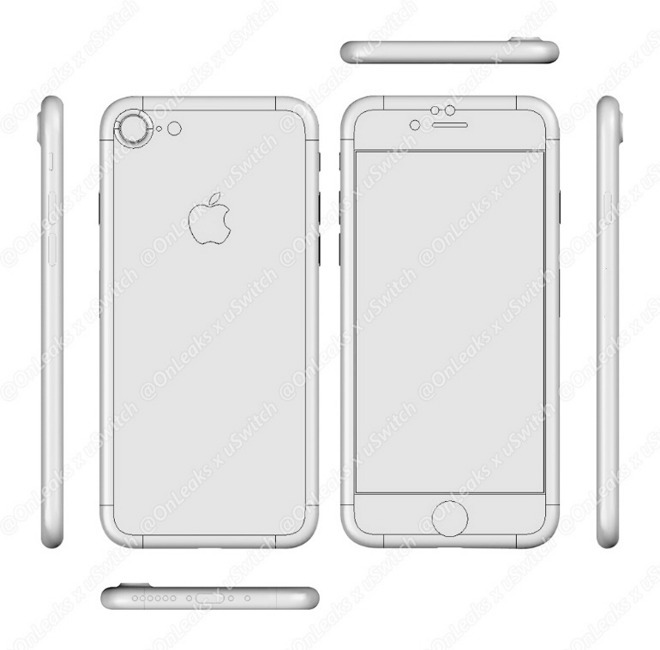 Alleged "iPhone 7" schematic, via USwitch. In addition, the so-called "iPhone 7 Plus" also features three dots presumably for a magnetic Smart Connector port on the back of the device, toward the bottom. That's also in line with earlier leaks showing designs with a Smart Connector, which could be used for charging. Notably, both the "iPhone 7" and "iPhone 7 Plus" designs lack legacy 3.5-millimeter headphone jacks on the bottom of the device. It's rumored that Apple plans to eliminate the headphone jack, leaving users to rely on either Lightning-connected headphones, or a wireless Bluetooth pair. Both iPhone models are also shown to have protruding camera lenses on the back, suggesting the camera "bump" that has existed since the iPhone 6 will remain. That contradicts some earlier rumors, which suggested Apple would utilize a new, thinner camera module to return to a flat-backed design. The confusion regarding the upcoming "iPhone 7" launch may be an indication that Apple Chief Executive Tim Cook's efforts to improve secrecy, particularly within the company's extensive supply chain, are finally bearing fruit. Back in 2012, he vowed to "double down" on secrecy, though leaks of upcoming products continued to surface.